. 薬師石　Yakushi Ishi at this Daruma-ji in Nara . 4. Kozenji Kamitonda, Wakayama Pref. 5. Koozei-Ji Suzuka Mie Pref. 7. Jooshoo-Ji, Okuwa, Nagano Pref. Chooshoo-ji 長松寺 in ? with a Tako Daruma 多幸(たこ)だるま. Now Museum for Sammlung von Kido Chuutaroo. Daruma-ji, Matsuyama [DARUMA-KAI 06,32 Ishii] near Dogon Onsen. Collection of ?Umetani ?Umedani Kikujiro 梅谷菊二郎. Building in form of a giant with the mouth as door. Selbst gebaut von Umetani mit Betonblöcken über 10 Jahre, bis er 88 Jahre alt war. 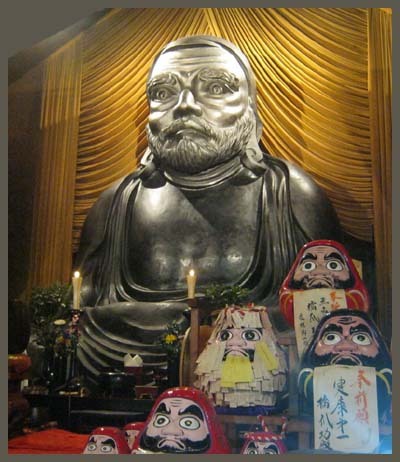 This temple has the largest statue of a standing Daruma, about 9 meters high. In their Daruma Do hall there is a collection of more than 5000 pieces. Huge Daruma Statue of 10 meters !
. Shigisan 信貴山,信貴山寺 Mount Shigisan Temple . Shinshuu Daruma with watercolor painting on his belly.